Jumbo stickers of cars, trucks, spaceships, heavy lifters, and more for hours of imaginative play. 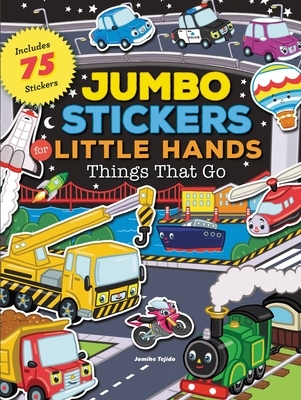 The colorful and joyful illustrations in Jumbo Stickers for Little Hands: Things That Go are sure to inspire imaginative play and storytelling. With 75 large (2 inches or larger) stickers and 22 pages of roads, construction sites, and more, there are no rules or set places for stickers to go. Jumbo stickers are perfect for learning fine motor skills, and even the youngest children with the smallest fingers can have loads of fun. Jomike Tejido lives in the Philippines and is an author and illustrator of more than 100 books, including the first two books in this series, Jungle Animals and Farm Animals. He works in digital art and specializes in whimsical illustrations. As a paper engineer, Jomike encourages play, a key role in the book experience. He is also a painter who does one-man exhibitions and has done eight shows since 2007.